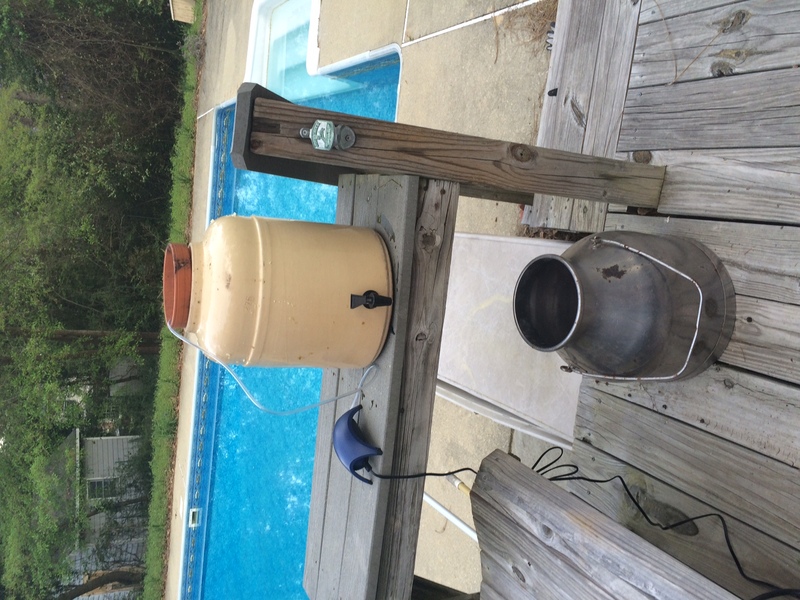 In our household I do all the food fermentation (veggies and dairy, occasionally curing bacon too). I also make mead, wine, cider, and ciser. My hubby primarily makes beer. I’ve brewed beer a couple of times so that I could understand the process, but beer brewing is one of my beloved’s favorite hobbies (and he’s very good at it), so I tend to leave that mostly to him. 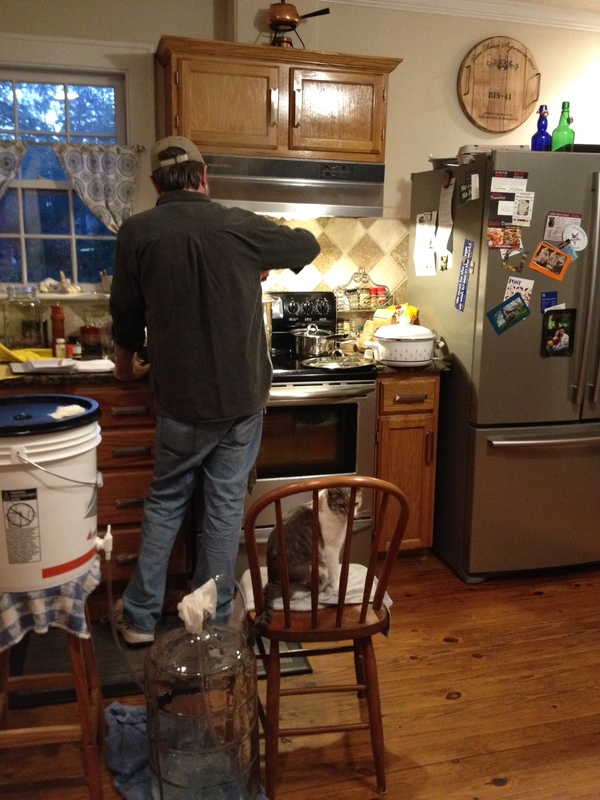 When he first started out, he brewed kits in our kitchen. The kits were easy (most, if not all, the malt is in liquid or dry extract form), but I encouraged him to brew all grain beer. In my mind, it is just another type of cooking. 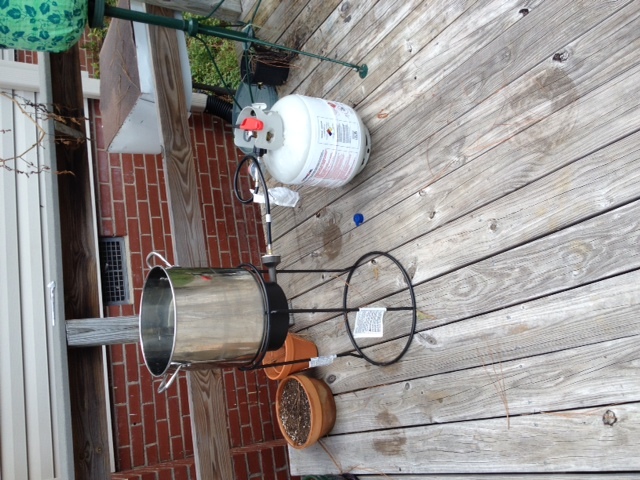 After reading many of articles and forums and watching lots of YouTube videos, my hubby built a mash tun, bought a propane fish fryer, a small oxygen tank, and a ten gallon brewing kettle. To brew beer all you must do is put your malted grain into the mash tun, bring about 5-7+ gallons of water to just before boiling and gently pour it into the mash tun with the grain (this is called mashing in). If you look at the mash tun (the modified cooler), you can see a tube with a valve coming out of it. Make sure the valve is closed before pouring the water in, or else it won’t be doing its job properly. After maybe an hour, open the valve and drain the liquid, called wort at this point) into the mash tun. While the grain has been mashing you would have boiled up a bunch more water which you very gently and slowly pour over the grains, this is called sparging. After you’ve collected all the sparged water in the mash tun, you boil the whole thing for about an hour. 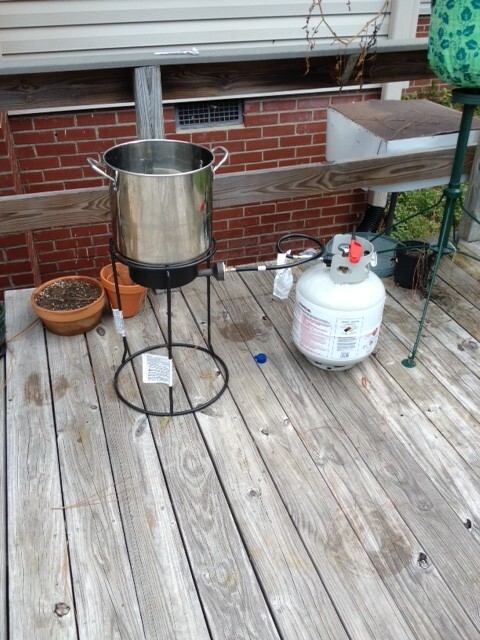 At certain points in the boil you add hops and/or other herbs and spices to bitter and add various other flavors. 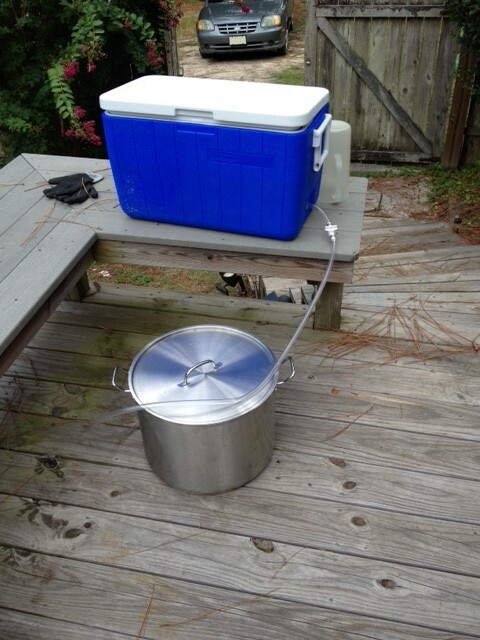 After all this you have to cool the wort down so that when you add yeast the heat doesn’t kill them. 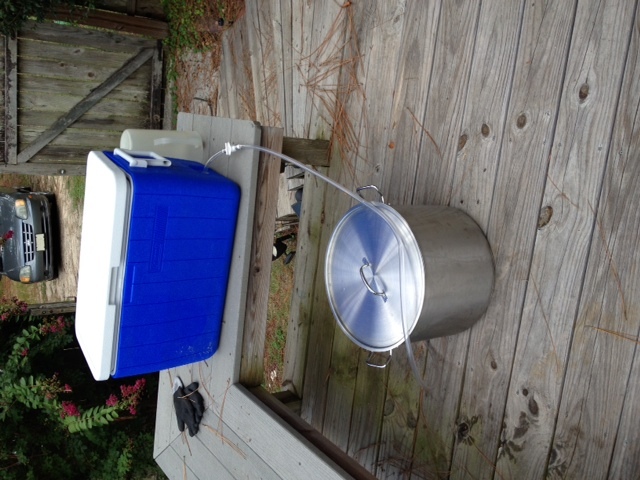 After various low-tech methods, my hubby bought a wort chiller (a big coil of metal tubing that cold water runs through while it sits in the wort) to cool the wort off quickly. 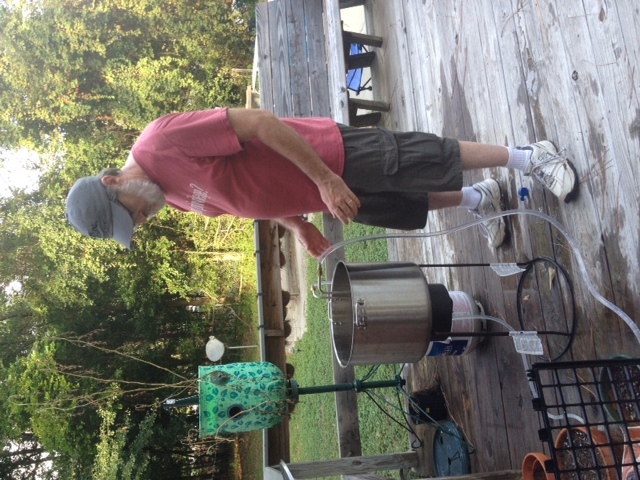 My hubby using the wort chiller to cool the wort. 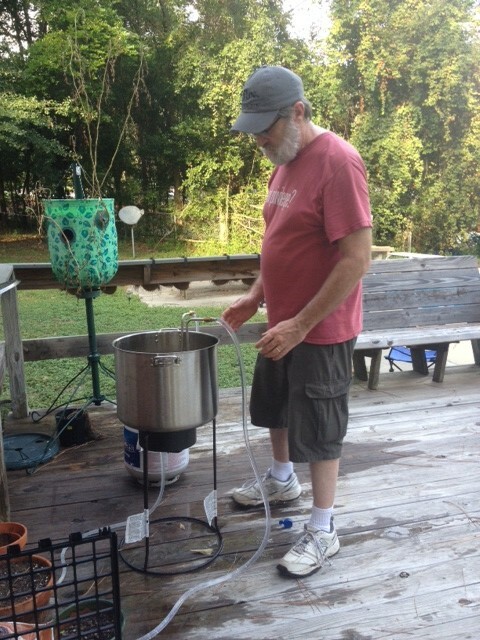 After all that he pours the cooled wort into a sanitized carboy, puts a sanitized tube attached to the oxygen tank into the wort and lets the oxygen flow into the wort for one minute. Adding oxygen is very important because the yeast needs it to multiply and thrive during fermentation. After that he adds his yeast, puts an airlock on it and lets the yeast do the job of multiplying and turning all the sugars extracted from the grain into alcohol. It isn’t until the wort has fermented that it is actually beer. Now having made mead, wine, and so forth, I knew a good deal about those darling little microbes called yeast. When I first heard Sandor Katz and Michael Pollan talk about the microbes in fermented foods I started reading a good deal about what happens during lacto-fermentation among other kinds of fermenation. I knew that the thing that makes your salted cabbage turn into sauerkraut is that all plant matter is covered in lactic acid bacteria (LAB), also known as lactobacillus. What I didn’t understand is how the vegetables got the microbes to begin with. A couple of weeks ago I went to a Master Gardening lecture by Dr. Al Bey called Teaming with Nature – Organic Yards and Gardens. Dr. Bey is a retired chemist. When he first moved to South Carolina from Michigan he used chemical fertilizers, herbicides and pesticides on his lawn and garden. He’d been a chemist his entire career, so he really didn’t know any better then. But soon enough he realized that the problems he was treating with chemicals were only getting more pervasive and he decided to try something different – organic lawn and garden care. I’m really glad Dr. Bey does have a background in science, because the handout we all received is 30 pages long! He has done all kinds of research to understand what needs to happen beneath the surface of the soil to produce beautiful, nutritious food and a lush yard. I certainly can’t go through it all here (this post is plenty long enough), but what I took away was the importance that microbes play in the nutritional value of the soil. If you have nutritious soil, you have nutritionally dense food, which in turn makes you healthier when you eat it. One of the richest sources of microbes that you can add to your soil is worm castings. I remember reading an article a few years ago (I want to say it was in Mother Earth News, but I can’t swear to that) where a couple in the wastes of Australia turned their horribly infertile land into a lush pasture by making worm casting tea and dripping in onto their soil. 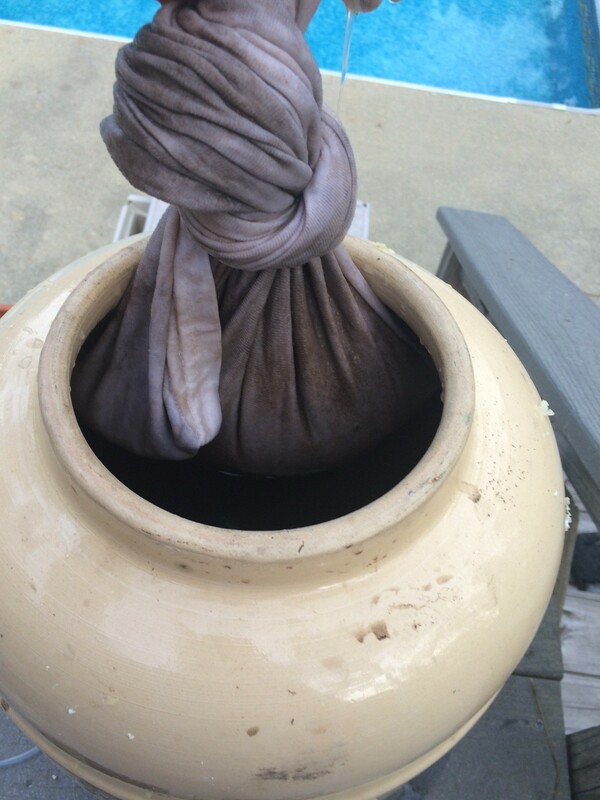 After hearing Dr. Bey talk about using worm casting and compost tea to enrich your soil it all started coming together in my mind! 1. Make worm casting tea to feed my soil. 2. Continue to feed the microbes throughout the year via dehydrated, non-sulfured molasses. 3. Eat the nutritious food as it ripens. If there’s more than we can eat, ferment it to eat later. It is so simple, but so intricately complex all at once! Feed the soil microbes and they in turn will feed you AND the microbes in your gut that are so tremendously important for your health. Now you may wonder what all the talk about beer was to begin with. Well let me show you what I did to start making my worm casting tea. This recipe was from Dr. Alvin E. Bey’s article Teaming with Nature (Article No. 8) – Energizing your Soil with Compost Tea. 1. 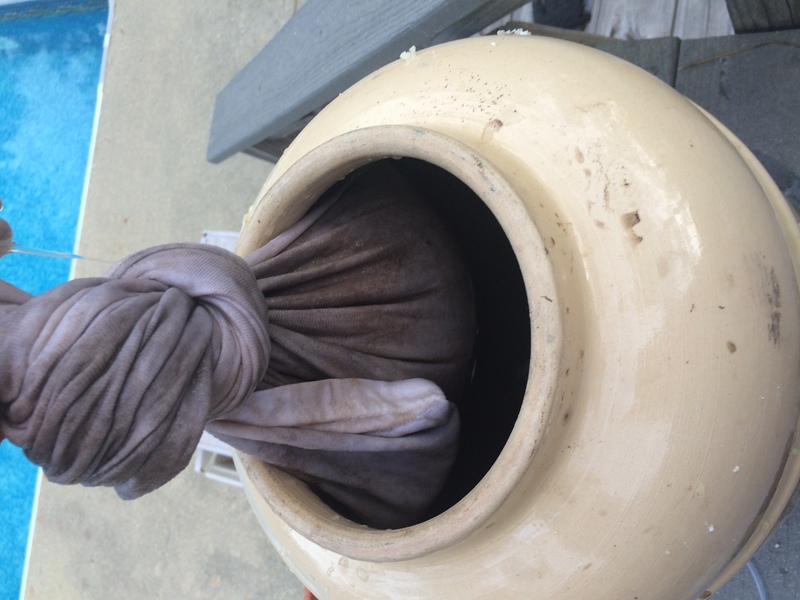 Fill a cloth bag with four cups worm castings, compost, or a combination of the two. 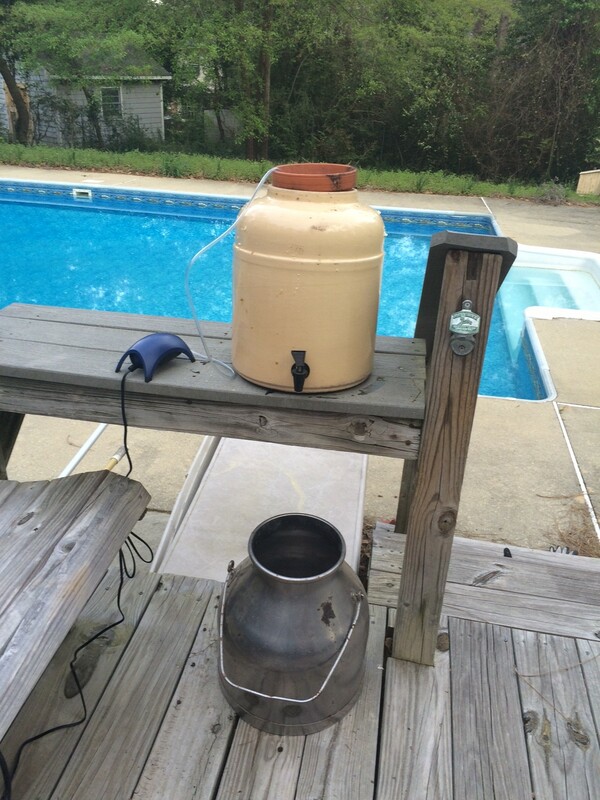 Add four gallons of water (I used rainwater I collected in a rain barrel) and two ounces of non-sulfured molasses as a food source for the microbes (I used locally produced cane syrup). Put it in a bucket or whatever you have to use. I used an old water cooler that I was using as a continuous kombucha brewer, but it has since cracked and the buch started seeping through. It works great for this though! Bag of worm castings going into the rain water. 2. Aerate with an aquarium pump or fountain pump for 24 hours. After the microbes have had food (cane syrup/molasses) and air, they multiply tremendously and can then be sprayed on your soil. You can see in the picture above, I drained my tea into an old milk pail that my grandparents used when they had dairy cows back in the 50’s and 60’s. After that I pour it into my watering can or a pump sprayer and sprinkle the tea over the soil. It doesn’t take too much in any one place. The idea is to get them into the soil so they can help the plant roots access minerals in a more effective way. I followed the sprinkling with a little bit of spraying with my water hose. I’m sure it was probably unnecessary, but I didn’t want the little critters getting lost. So in both the beer and with the worm casting/compost tea, the various microbes need air and sugar to reproduce and do their jobs. Now I am the kind of person that wants to really understand how things work. I’ve decided to audit some classes in the near future on biology and microbiology. I took biology in college, but the poor old instructor was literally senile. We barely learned anything in that class, so I want to go back and learn it properly. I want to see the various microbes under a microscope and see what it is that they do! While I’ve been ruminating over this whole concept the past few weeks, I started listening to a new podcast (new for me, that is), The People’s Pharmacy. I happened to listen to Episode 959: Farmacology – What Farmers Can Teach Us About Health, which is the title of a book by Daphne Miller, MD. Dr. Miller has done some of the research that I have been so curious about. I sat down this evening and began reading. I got ao excited reading about the connection between nurturing the soil and nurturing our bodies, I had to get out of bed to write about what has been bouncing around my brain!